This hasn't happened much in the past two months, but today after a long cry and a few minutes resting in child's pose on the yoga mat, I pulled it together. 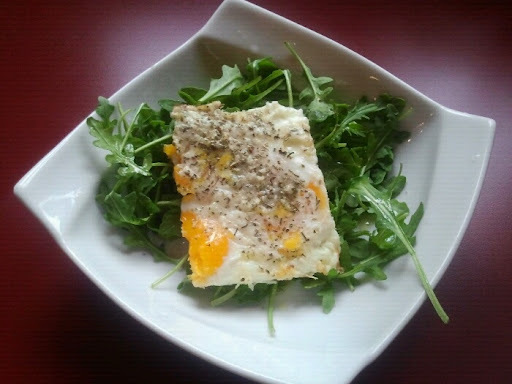 I asked my food guru Nik for some advice on the arugula (evoo and freshly squeezed lemon) and went back to my favorite baked herb roasted eggs. For the outfit, I dug the thrifted polka dot dress out of the closet (it stopped fitting a few months ago), wrapped a pearl necklace around my left wrist, and finally wore the Eloquii mustard leather jacket. And this is what it looks and tastes like to be normal again. Love the jacket. I'm looking for a short leather jacket in a great color. Where did you get yours? Hey Isa, I bought it from eloquii, which is a plus size shop, but they are a subset of The Limited. You may have luck checking there. What herbs do you put on the roasted egg? That looks amazing and I'm definitely in need of a 'taste of normal' at the moment, as well.